Last week, no park reached wait times higher than a level ‘5’ on our scale and most days stayed between ‘1’ and ‘3’. That means posted wait times averaged 10 to 30 minutes at most attractions. Universal Parks continue to be the least crowded parks in Orlando this fall. 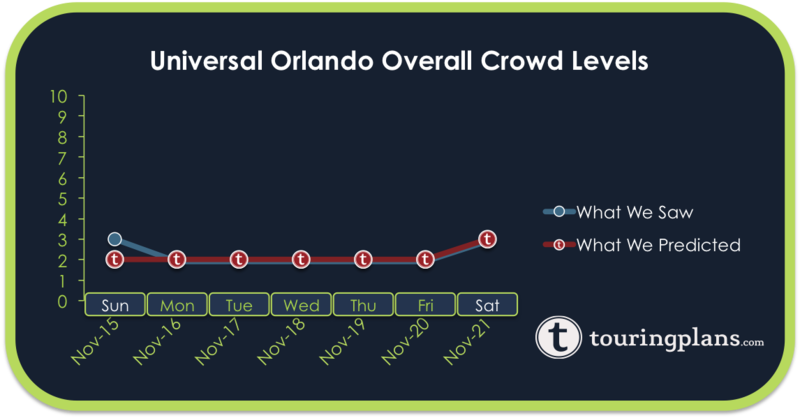 Compared to the crowd level ‘8’s and ‘9’s we have seen at Magic Kingdom, Universal crowds have been much more desirable for those of us who prefer low wait times. Wait times told a simple story at Universal parks last week – low crowds. It all started on Sunday with no attraction having an average wait time above 40 minutes. Monday’s wait times were the first of a three day streak with Universal Studios at ‘2’ and Islands of Adventure at ‘1’. The highest average wait at Universal Studios other than Despicable Me: Minion Mayhem was Men in Black at 14 minutes. Tuesday’s wait times at Islands of Adventure hit averages like 8 minutes at Jurassic Park River Adventure and 18 minutes at Harry Potter and the Forbidden Journey. More very low average waits at both parks on Wednesday. Thursday brought more of the same with no attraction hitting an average above 29 minutes. Friday’s wait times were about the same as we saw all week with Islands of Adventure edging slightly higher but still well below the middle point of our crowd scale. Saturday’s crowds although the busiest of the week were below average for the year and perfectly manageable for Universal guests at both parks. 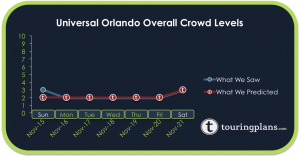 Thanksgiving week will bring significant crowds to Universal’s central Florida competitor but crowds at Universal will be much more manageable. While arguments have been made that Fastpass+ is driving up wait times at WDW, I think there just may be a lack of interest at Universal Studios right now. I’ve been reading the weekly crowd reports from this site for quite some time now, and there will be dozens of comments on the WDW report, but very few (and sometimes zero) on the USO report.